A four-man team is to retrace a famous journey by Orkney's 19th Century Arctic explorer Dr John Rae. Born in 1813, Dr Rae signed up with the Hudson's Bay Company - when the fur trade in Canada was at its peak - and charted vast areas of unmapped territory using his surveying skills. 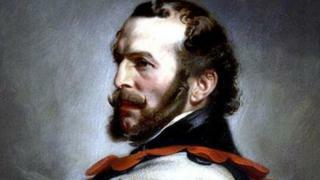 He is credited with finding the final part of the Northwest Passage, around the top of North America. The modern day team is setting off for the 400-mile ski challenge on Friday. The aim while retracing the journey is to raise awareness of a man regarded as one of Scotland's greatest explorers. It was during his search for traces of Capt Sir John Franklin's ill-fated expedition of 1845 - when he and his entire crew died - that Dr Rae found himself condemned to obscurity. In 1854, he had recorded accounts from local Inuits who said that some of Franklin's crew had resorted to cannibalism in a last desperate effort to stay alive. He reported his findings in confidence to the British admiralty, but they made their way into a newspaper. Franklin's widow - and much of Victorian society - were horrified at some of Dr Rae's findings, and his reputation never recovered. The controversy overshadowed the fact that, during his searches for the Franklin expedition, Dr Rae had mapped out a navigable shipping route linking the north Atlantic to the Pacific. His mapped stretch of water became known as Rae Strait. Canada's native Cree called him "Aglooka" - meaning "he who takes long strides". He died, in relative obscurity, in 1893. Expedition leader David Reid, originally from Renfrewshire, Richard Smith, from West Lothian, and Canadians Frank Wolf and Garry Tutte are gathering this weekend for the start of the expedition. Once fully under way, they will be hauling 90kg sledges for nine hours daily and it is estimated this could be for up to 40 consecutive days. Mr Smith said: "History books have long recorded the feats of explorers like Captain Scott and Ernest Shackleton. "Unfortunately, history and the (then) establishment have not been so kind to the remarkable Orcadian, John Rae. "His remarkable achievements included mapping over 1,750 miles of Arctic coastline and the discovery of what he would name Rae Strait - the missing link in the Northwest Passage. "It was also Rae who discovered and reported back to the Admiralty on the grisly fate of the previous Franklin expedition." He added: "The Arctic Return expedition will be extremely tough but ultimately our aim is to raise awareness of the exploits of John Rae and to help restore his rightful place as one of the greatest Scottish explorers in history."